I read that this is the summer of the “supermoon.” According to NASA, a supermoon occurs when a full moon appears at a time when the moon orbits closest to the earth. The nearness makes the moon look bigger and brighter. This summer the supermoon will appear several times including last night and tonight. Taking a picture of the supermoon, or the moon at any time is actually very easy. You don’t need a special camera or lenses. The trick is to remember that you need to set your exposure for the subject of your image, in this case, the moon. Since the moon is very bright, you can use a low ISO setting. The image below was taken with the following settings. ISO 160, f/4.0, 1/320 and with a lens at 200mm. Remember to keep your shutter speed high enough to eliminate motion blur or use a tripod for extra clear pictures. 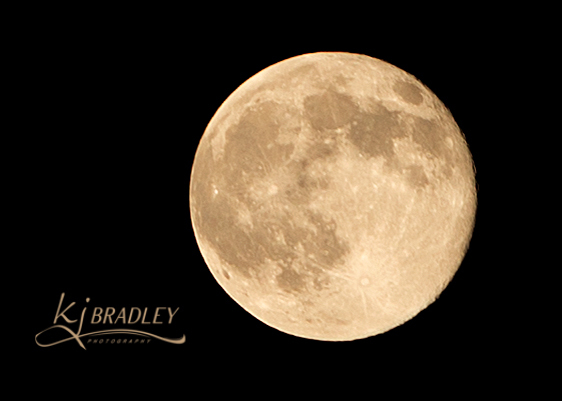 One thing to consider when photographing a supermoon is that in pictures, it will look just like any other full moon. To show the size of the moon, photograph it with a point of reference like a tree or skyline (I did not do that with the picture above so you can’t tell when it was taken). According to NASA, the supermoon will appear again on August 10 and September 9 of this year. I would love to see your results!